The well-known instant messaging application, of course, WhatsApp is undoubtedly one of the best and most used private messaging apps out there. With constant news, has managed to remain at the top of the choice of users. 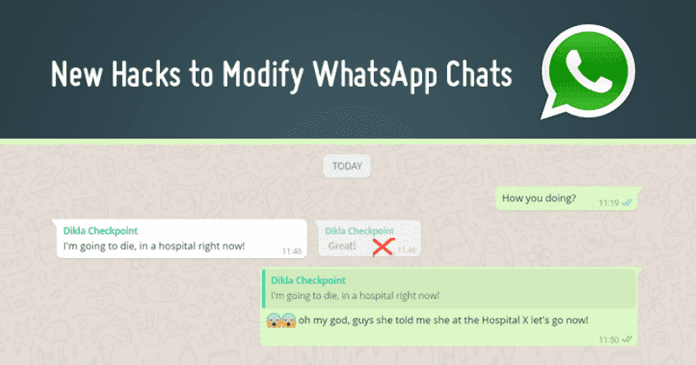 But, now according to the latest reports, this new WhatsApp flaw lets users modify group chats simply to spread fake news. With more than 1.5 billion active users and 60 billion messages sent daily, the well-known instant messaging application, of course, WhatsApp dominates and is one of the most used instant messaging services. Hence, the well-known instant messaging application, of course, WhatsApp is undoubtedly one of the best and most used private messaging apps out there. With constant news, has managed to remain at the top of the choice of users. Though everything seems to be positive for this service, of course, the well-known instant messaging application WhatsApp but the truth is that it has gone through serious problems. But, as we told like any other service it also has flaws and problems, always resolved quickly. However, a new one has now been revealed and shows that there is a security flaw that allows sent messages to be changed by third parties and resent with information that has not been transmitted. Still fighting against the spread of fake news, the most used and the well-known instant messaging application, of course, WhatsApp now has a new flaw that allows you to change the original messages that have been received from any user. Who discovered the flaw was Check Point Research that showed in detail how the flaw can be exploited. Using an algorithm that reverses the WhatsApp message encryption system, you can change an incoming message to contain a different message. The problem could be just the record that is local, but the truth is that messages can then be forwarded with this change, with the (original) source of the original sender, and delivered to individual groups or users. There are more changes to messages and conversations that can be made and discovered. Interestingly, and throughout the process, the cipher is never broken and the failure is limited to changing fields of the original message when it is forwarded, usually in the citation. For example, it is simple to change the sender of a message in a group, thereby changing its origin and completely changing the sent message. Even in groups, it is possible to send a message to a single user, without his/her realizing that he/she was the only recipient. It is also possible to create a false message history with a contact by changing only the original message and the sender and then appears in the conversation window as if it were original. After the discovery, the failure was immediately reported to the most used and the well-known instant messaging application, of course, WhatsApp, which rejected its importance and indicated that it does not intend to correct or even change its security protocol. According to the most used and the well-known instant messaging application, of course, WhatsApp information, this (alleged) failure has no security implications and does not break its cryptographic and message protection mechanisms. To change this behavior all messages would have to be scanned, which would break privacy. This is a serious problem, even more so at a time when the most used and the well-known instant messaging application, of course, WhatsApp is in place against false messages, the spread of lies and the impact it has had in extreme situations.